Imported from Italy. Deep Treatment Conditioner Spray. Specifically formulated for dry or damaged hair caused by chemical treatments or atmospheric agents such as the sun. Restores softness, shine and elasticity to hair while helping to prevent damage from styling, and chemicals. Forms a natural symbiosis with the hair-feel the dramatic effect of the Nectar. Rich in mineral complexes of zinc, copper, iron, and magnesium. 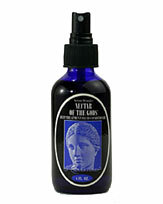 Bestows immediate and permanent results-hair which moves and shines. Revitalizes hair, seals the cuticle and prevents color fading.